Newcomer Family Obituaries - Leron Ragin 1921 - 2019 - Newcomer Cremations, Funerals & Receptions. Leron Ragin, age 97 of Dayton, passed away February 8, 2019. 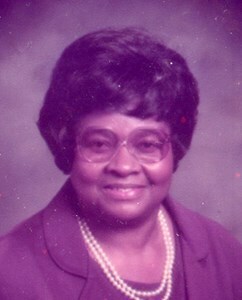 She was born April 27, 1921 in Milan, TN to the late Theodore and Ola Wright. Preceded in death by 2 sisters: Theria and Dorothy; 3 brothers: John, Floyd and Bennie; and husband, Robert. Leron is survived by sister, Mary Reid; brother, Ralph (Jan) Wright; devoted niece, Pat (Willie) Oliver; nephew, Darrell (Dianne) Wright; and a host of other relatives and friends. Leron was saved at an early age and was a faithful member of Bethel Church of God in Christ. She retired from The Home Store / Elder Beerman's. She loved to cook and garden. Although Leron never had any children of her own, she devoted her home and herself to her nieces and nephews. Visitation will be held from 9:00-9:30 am on Friday, February 15, 2019 at Newcomer North Chapel, 4104 Needmore Road, where the funeral service will begin at 9:30 am. Burial to follow at Dayton National Cemetery at 11:45 am. The family would like to extend a very special thank you to the staff at Dunbar, especially Kim, Nicole and Wes and the nurses at Miami Valley Hospice for their loving care. To share a memory of Leron or leave a special message for her family, please click the Share Memories button above. Add your memories to the guest book of Leron Ragin. I met Mrs. Ragin in 2001 when I came to Arbor's. Even though I left Ohio in 2007, I would fly back every couple of months to see my Mrs. Ragin . You will always be in my heart.